Love your kit designs and really do appreciate your time and effort however, some kits ain't showing up. Most likely becuase at such low levels SI didn't assign proper shirts in kit section. My future updates will contain editor file with that stuff corrected. A major update to this pack. Me and frankthetank joined forces to create as many level 9 leagues as possible. 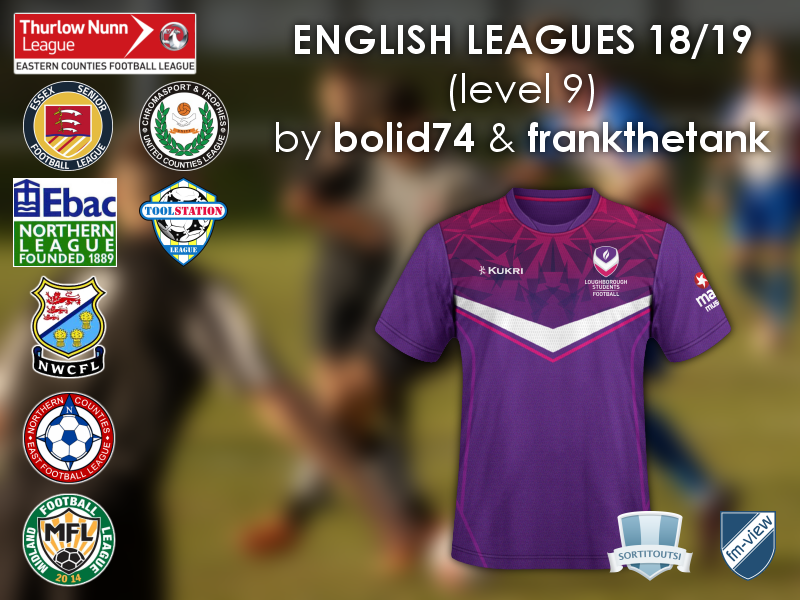 England - English League Level 9 SS'2018/19 by bolid74 & frankthetank87 Relink! (29/11/18) - Not SSKCC yet! This pack is now updated with new league: Northern Counties East. 5 leagues are included. This pack is now updated with Midland league. There are 6 leagues now in the pack. I also added kits for Hashtag United, which seems to be popular above average for a level 10 club. I included config file for it, but you'll have to enter manually their ID. They're not included in original game, so their ID will vary depending on which database you use. England - English League Level 9 SS'2018/19 by bolid74 Relink! (22/12/18) - Not SSKCC yet! Really appreciate your work! Hoping to see United Counties Premier soon! I've been looking around, but I can't find anything sadly. How did you get the other kits for the other leagues? The best I could find is some digital renders. For each team I browse their Twitter, Facebook and website. Some of them have photographers who keep flickr accounts with galleries for many games. It's a time consuming process that often lasts more than actual kitmaking so for lower leagues I usually have partners who do that. 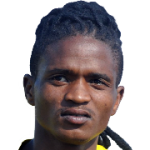 This pack is now updated with United Counties league (level 9). Fantastic work bolid! Truly appreciated. 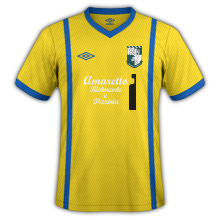 Any plans to do kits for the South Midlands Football League? I'm working on Western league right now so I can put your league on the list next. Great to hear! Looking forward to it. Thanks. 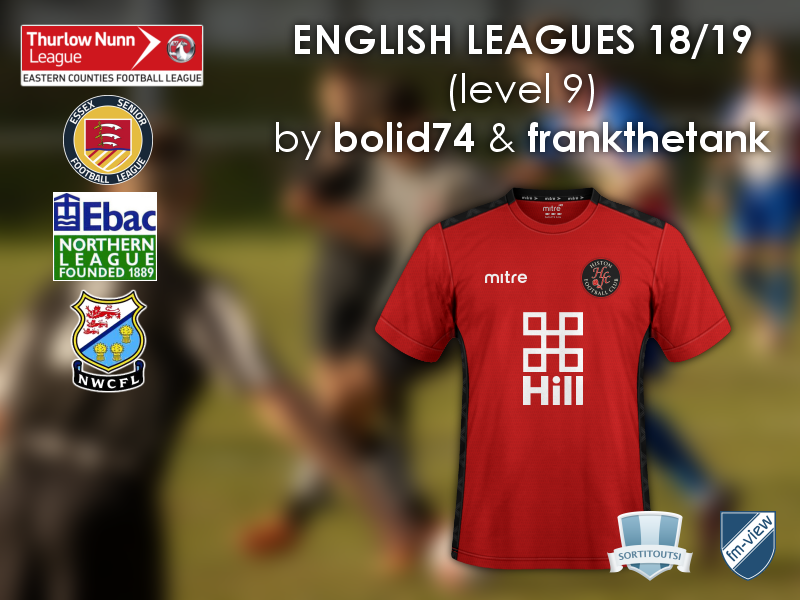 England - English Leagues Level 9 SS'2018/19 by bolid74 Relink! (15/01/19) - Not SSKCC yet! Western league (English level 9) is now included in this pack. There are now 8 leagues. England - English Level 9 SS'2018/19 Relink! (18/01/19) - not SSKCC yet! I researched that league but the situation with pictures is terrible. I was unable to find information about dozen or so away kits, Edgware included. I'm very close to give up on this league. 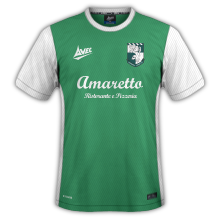 I can make Edgware only, if you can find pictures of away kit. I'm not making any more leagues at that level without a partner who can research teams and provide pictures and/or links to galleries. The amount of time wasted on browsing websites and twitters is ridiculous. Actual kit making takes less time than research. I actually had to give up on two leagues because I was unable to find pictures of to many away kits. So it's an open invitation to everyone, collect pictures for any level 9/10 league and I'll make it in a week. Here you go then. You'll have to add an away shirt in editor to see away kit. Any chance there will be combined county premier league kits, such as camberley town?